For the current session, see 80th Oregon Legislative Assembly. 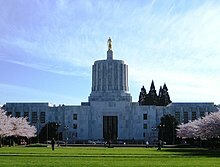 The Oregon Legislative Assembly is the state legislature for the U.S. state of Oregon. The Legislative Assembly is bicameral, consisting of an upper and lower house: the Senate, whose 30 members are elected to serve four-year terms; and the House of Representatives, with 60 members elected to two-year terms. There are no term limits for either house in the Legislative Assembly. The legislature is termed as a “citizens’ assembly” (meaning that most legislators have other jobs.) Since 1885, its regular sessions occurred in odd-numbered years, beginning on the second Monday in January. Effective 2012, the legislature moved into an annual session, with the even-numbered years having a 35-day “short session” beginning in February. Bills may be introduced in either house, and must flow through a committee before being voted upon. Bills calling for increased revenue must be introduced in the House of Representatives. A legislative resolution referred to voters in the Nov. 2010 general election amended the state’s constitution and changed the schedule of regular sessions from bi-annual to annual. Senate Joint Resolution 41 was voted on as state Ballot Measure 71, which passed statewide by a margin of more than 2 to 1. With limited exceptions, the constitutional changes enacted through Measure 71 limit the length of legislative sessions beginning in odd-numbered years to 160 calendar days, and sessions beginning in even-numbered years to 35 calendar days. The changes took effect with the 2011 session. The first 35 regular sessions (i.e. until 1929) lasted 50 days or less. Since 1949 no annual session was shorter than 100 days. The longest session was the 72nd regular session, at 227 days, ending August 27, 2003. More recent sessions ended in June or July. The Governor of Oregon was the only person who could call the assembly into special sessions until 1976, when voters approved a constitutional amendment allowing the legislature to call itself into session. In either case, special sessions are permitted only “in the event of an emergency.” Voters narrowly defeated a constitutional amendment in 1990 that would have established annual sessions. In 1982 a special session lasted 37 days, and the governor called the assembly into special session five times in 2002, for a total of 52 days. The 2006 special session was the shortest in Oregon’s history: five pieces of legislation were passed in only six hours. The legislative body may also call itself into special session “in the event of an emergency,” although it has never done so. The legislature’s regular sessions were every two years until 2009. The legislative session in 2010 that referred Measure 71 to voters was a special session approved during the 2009 session by a majority of legislators, who were hoping to eventually win approval of a change to regular annual sessions. The push for annual sessions dates back to at least 1981, when a poll of legislators found that two-thirds favored a shift to annual sessions. In the interim between legislative sessions, special study groups made up of state legislators with interests or expertise in the specific study areas investigate issues that will be addressed during the next legislative session. In addition, the state’s legislative Emergency Board, which is jointly chaired by the President of the Senate and the Speaker of the House, can take action to provided additional funds to state agencies for activities required by law or that arise unexpectedly during the legislative interim. ^ “Oregon’s Legislative Assembly, Oregon Blue Book”. State of Oregon. Retrieved 2015-06-29. 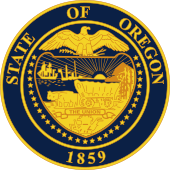 ^ “Oregon Legislative Assembly History” Oregon State Archives. ^ “How an idea becomes a law”. Oregon State Capitol. ^ State of Oregon. “Oregon State Legislature”. State of Oregon. Retrieved July 2, 2011. ^ State of Oregon. “Oregon Secretary of State Elections Division” (PDF). State of Oregon. Retrieved July 2, 2011. ^ “Who calls special session?”. The Register-Guard. Eugene, Ore. February 3, 2008. ^ Sinks, James (February 24, 2008). “Successes for region in special session, but some legislators are unimpressed”. The Bulletin. Bend, Ore.
^ “Legislative Statutory Committees and Interim Offices, Emergency Board”, Oregon Blue Book, Oregon State Archives, Oregon Secretary of State, Salem, Oregon, 2017, accessed 27 July 2017. ^ “Other Legislative Committees”, Oregon Legislative Assembly History, Oregon State Archives office, Oregon Secretary of State office, Salem, Oregon, accessed 27 July 2017. Official website — A note: At the website the body is referred to as the “Oregon State Legislature”, however it is constitutionally named the “Legislative Assembly”.